GRAND OPENING OF OUR NEW CAMANO ISLAND LIBRARY! We congratulate all the efforts of so many people who made our new Camano Island Library a reality. Without the community’s voice of the people through 2 elections, 2 opportunities for the people of Camano Island to be heard, the Pilot Library would have ended. 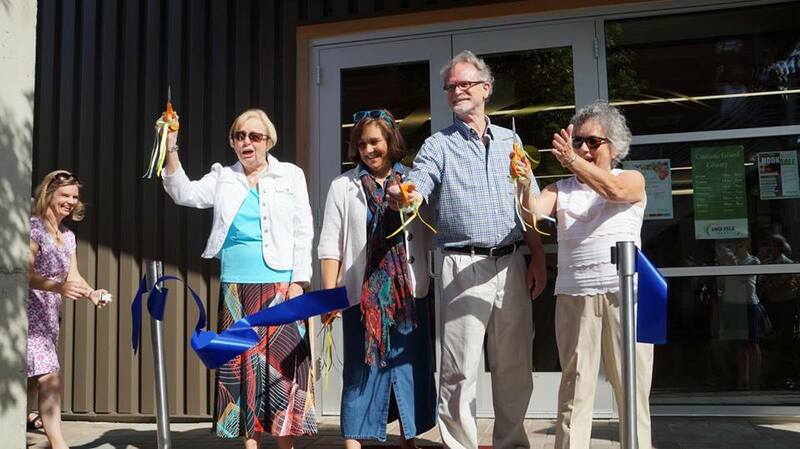 On August 1st, 2015 the Camano Island Library celebrated it’s grand opening. After a few speeches entailing recognition to each organization, and to you, our neighbors and friends, the time had finally come. With much joy and anticipation, the ribbon was cut by (from left to right) Jackie DeFazio, Sno-Isle Libraries Trustee, Helen Price Johnson, Island County Commissioner, Dan Nelson, Architect, and Jonalyn Woolf-Ivory, Executive Director of Sno-Isle Libraries. What an exciting moment for all! Our library has economical lighting to save energy from room to room on auto dimmers that also accentuate the feeling from the Reading Room to the Main Center where Jack Archibald’s dichromic stained glass window make colorful light on the floor and moves with the day. Also in the Reading Room, the sofa like chairs are connected by a table that provides a plug in for you laptop or charge your cell phone! How convenient! Another great feature is the Community Meeting Room. It has the ability to provide organization access to the community even after hours. Two metal gates close off the main part of the library and staff offices. A second massive wooden door on a slier mechanism also closes off access to the computer and main check out center. With these doors closed, it provides access to and from the restroom as well as separate entry and exits convenient for after hours. To make reservations for the meeting room, simply make a request through the Camano Island Library system, and a response within 24 hours will let you know if available. The Camano Island Library also has its own Children’s area! You’ll see the quilt hung on the wall made during the Camano Island Library’s 7th birthday by the Camano Island Quilters. It was hanging in the Pilot Library since last spring. A cute sequential caterpillar like soft stools for reading accents the room quite nicely. And the carpet design is intriguing with a mixture of out of order and rotated on squared tiles alphabet-like letter perhaps from a futuristic alphabet. Of course the children’s room has a computer, too! 2 I-pads are available in the near future as well for “in-house” check out. The Teen Section has a bar-level computers and a great selection on shelf. Many books are new. It’s a great feeling to pick out a book, and feel special because you’re the first one to use it! As always, if you need to find another book, the online system is always a good resource. But you may find our helpful librarians are very quick and always have a smile to cheer your day. We are all very excited to see the Camano Island Library develop and we leave it as a legacy for our future generations to have, learn, and explore its wealth of knowledge at your fingertips. Thank you to Sno-Isle Library coverage of the grand opening pictures and the video posted on You Tube, we are able to bring this exiting moment to you. Please come visit and explore the Camano Island Library!